Nate Diaz vs Jim Miller UFC on Fox 3 Fight Pick & Preview | MMA Fighting Events Videos Techniques UFC Fight Picks and News. Nate Diaz vs Jim Miller will headline UFC on Fox 3. UFC (Ultimate Fighting Championship) and MMA (Mixed Martial Arts) fans will be in for a solid main event as this fight has title shot implications. Another win for either Nate Diaz, or Jim Miller will put them at the front of the line for a UFC Lightweight title shot. These fighters are both hungry for a title shot and their roads have led them to this collision. Jim Miller comes into UFC on Fox 3 with an impressive overall record of 21-3. He's 9-1 in his last ten fights, with the only loss coming to current UFC Lightweight champion Ben Henderson. Miller has excellent ground fighting skills including submissions. Twelve of his wins have come via submission. Nate Diaz comes into UFC on Fox 3 with an underrated record of 14-7. He's fought the top fighters in the UFC Lightweight division, and there really hasn't been an opportunity to "pad" his record. Diaz is coming off two solid wins. At UFC 135 he submitted MMA legend Takanori Gomi with an armbar submission and most recently he beat a tough Donald Cerrone at UFC 141. Diaz vs. Miller will come down to who can dictate the fight standing as they are equally matched on the ground. Standing, Diaz will be able to pepper Miller with the "Stockton Slap" boxing style. If Miller can't score a takedown and smoother Diaz, Miller will lose a decision. 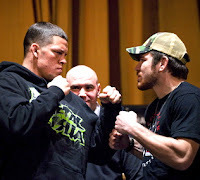 My official fight pick for UFC on Fox 3 is Nate Diaz via judges decision. UFC on Fox 3 will take place at the IZOD Center in East Rutherford, New Jersey. Check out a highlight fight video promo for Diaz vs. Miller by MMA Interviews. Who are you picking in this fight?